Heinrich Günther Prien, Navy U-boat Commander, was born on January 16, 1908 in Osterfeld/Thüringia, the son of a judge. In 1923, he joined the German Merchant Navy, receiving his Master’s License in 1932. He subsequently joined the German Navy and went into the U-boats, receiving command of the U-47 in 1938. A year later, shortly after the outbreak of World War II, Günther Prien took his submarine into Scapa Flow and sank the British battleship HMS Royal Oak. 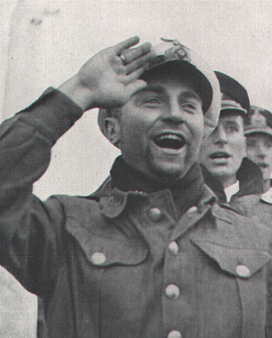 Upon returning to Germany, Prien and the crew of the U-47 received heroes’ welcomes in Berlin. Prien received the Knight’s Cross of the Iron Cross. His later career saw him promoted to Korvettenkapitän (Lieutenant Commander) and awarded the Oak Leaves to his Knight’s Cross. He conducted ten wartime patrols, spending 238 days at sea.